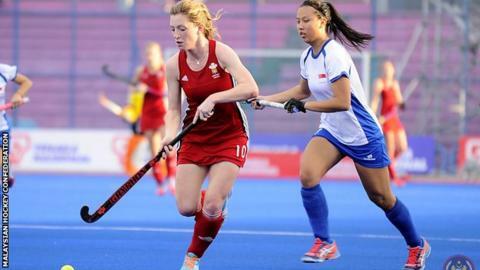 Wales Women made history by securing their place in hockey's World League quarter-finals thanks to a 3-0 win over Thailand in Kuala Lumpur, Malaysia. Wales, competing in round two of the World League for the first time, finished second in Pool A behind Italy with two wins from three. Natalie Blyth, Beth Bingham and Eloise Laity scored against a Thailand. It was also the second consecutive clean sheet for goalkeeper Rose Thomas after their 7-0 win over Singapore. Wales' tournament opened with a 3-0 defeat by Italy and the convincing win against Singapore followed in Kuala Lumpur. It is the first time Wales' women's hockey side have played at this level of competition. They will meet Kazakhstan in the their quarter-final on Thursday. Kazakhstan finished third in Pool B, one place above winless Hong Kong. In the Pool A clash with Singapore, Wales' Natasha Marke-Jones opened the scoring. There were two goals each for Lisa Daley and Phoebe Richards, whilst Abi Welsford also found the net and Sarah Jones completed the rout. Find out how to get into hockey with our special guide. Can Welsh hockey rise to the challenge? Read more on Can Welsh hockey rise to the challenge at international level?